I was lucky enough to see Liberace before he died. The concert was a weird, wild, wonderful spectacle, and it left me awestruck. I couldn't believe that a entire performance (not to mention a several decades long career) could be construed from such unrestrained, indulgent superficiality. The majority of the show consisted of Liberace parading around the stage in outrageous outfits to the "oohs" and "ahhs" of the audience, which was dominated by women over the age of forty. At one point he appeared in what he claimed was the world's most expensive fur--a Norwegian blue shadow fox cape with a train 12-feet wide and 16-feet long. "There's only two of these in the world," he giggled with child-like glee, "and I've got both." At another point he pranced around in a pink, glass suit embroidered with silver beads, which lit up during the encore. He was all gooey smiles in dimples, wavy hair, and outlandish rings. "Well, look me over," he said with a devilish grin. "I don't wear these to go unnoticed." The audience roared with delight. It was a real lovefest. I was stunned by the gleeful absurdity of it all. His trademark candelabrum with electric lights sat atop a glass-topped piano. A handsome, strapping, young man assisted Mr. Showmanship in changing various coats, robes, and crowns. Liberace made bedroom eyes at him, as did the ladies in the audience. At least a half dozen times, he left the stage "to go slip into something a little more spectacular." Each time Liberace made another grand entrance in a new outfit, he'd invite a few women on stage to admire the fur and diamonds. "I'm glad you like it," he cracked, "you paid for it." It was obvious he had used the same jokes countless times before, but the audience ate up every one. Of course, he played lots of music too, songs like "The Impossible Dream," "Send in the Clowns," "Theme from Love Story," "Close to You," and "Raindrops Keep Falling on My Head." Liberace's piano playing was just like his clothing--showy, sentimental, and absurdly fancy. At every opportunity he ran his nimble fingers up and down the keyboard in endless frills and trills. The audience evidently took this for great skill. Not that the music mattered much. It was just a light diversion to break up the costume party. At the end of the exhausting two-and-a-half hour show, he cracked, "I've had such a marvelous time I'm ashamed to take the money"--pause, wink, wink--"but I will." The cheering and smiling and blowing of kisses started all over again. Elderly women filled the aisle in front of the stage to kiss his cheek. Liberace kept grinning like there was no tomorrow. Even his teeth gleamed. 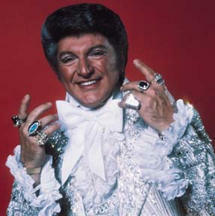 Liberace had elevated style over substance until there was no substance left at all. Liberace was an international superstar dating back to the early 1950s. He averaged $5 million a year in income for more than 35 years. 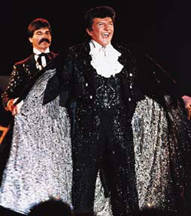 The 1978 Guinness Book of World Records identified Liberace as the world's highest paid musician. He was born Wladziu Valentino Liberace in a Milwaukee suburb in 1919 to poor parents. He was classically trained on the piano as a youth and made his concert debut as a soloist at age 11. As a teenager during the depression, he played piano in speakeasies to make money for his family. In 1940, Liberace moved to New York and scrounged for small-time nightclub gigs. His charm and piano playing paid off, and within seven years he was touring the hotel clubs. Liberace's story might have fizzled right there, but he got in early on two gold mines--Las Vegas and TV. In the late 1940s he began playing extended runs in Las Vegas, which was just becoming an entertainment and gambling center. He would appear at the casinos in Vegas regularly for the rest of his life. And as Vegas grew, so did Liberace's fame and his paychecks. It wasn't until Liberace was on the tube that he ascended to superstar status. In the early 1950s, Liberace had a variety show on TV, which was in its infancy. He played his fancy piano, did a little soft shoe, spoke to the audience in his hyper-sincere fashion, incessantly praised his mother Frances, who was always in attendance, and joked with his brother, George, the show's band leader. His television show was wildly successful and was carried by more stations than I Love Lucy. In 1954 he played to capacity crowds at Carnegie Hall, Madison Square Garden, the Hollywood Bowl, and Soldier Field in Chicago. In 1955 he opened at the Riviera in Las Vegas for $50,000 per week, becoming the city's highest paid entertainer. He was bonafide superstar with over 200 fan clubs. He received 7,000 fan letters and 12 marriage proposals a week. He also received 25,000 Valentines each year. He bought lavish mansions, remodeled them extravagantly, and filled them with ornate pianos, antiques, and furniture. He even had a piano-shaped swimming pool installed in his backyard. Liberace's musical repertoire included a unique mix of classical, boogie woogie, movie themes, cocktail jazz, and sentimental ballads. He knew thousands of songs and could play almost any request from the audience. He freely edited long classical pieces down to four to six minutes. "I took out the boring parts," he quipped. "I know just how many notes my audience will stand for. If there's any time left over, I fill in with a lot of runs up and down the scale." This approach enraged serious music critics, who were mostly male. They wrote vicious reviews of Liberace's music, particularly in the beginning of his career. For instance, in 1956 a British tabloid called Liberace a "deadly, winking, sniggering, snuggling, chromium-plated, scent-impregnated, luminous, quivering, giggling, fruit-flavored, mincing, ice-covered heap of mother love." In case his position wasn't perfectly clear, the writer concluded that Liberace was "the biggest sentimental vomit of all time." By the end of his career, the critics realized that criticizing Liberace was a fruitless endeavor. The women loved him anyway, and Liberace just didn't care. He was too busy raking in the dough. He also amended his response to the criticism with this zinger: "Remember that bank I used to cry all the way to?" (Pause, smile, wink.) "I bought it." Liberace wasn't always so outlandish. In the early 1950s he wore a relatively modest white tux on stage. To get some sparkle off the stage lights, he upgraded to a gold lame jacket. He commissioned more elaborate costumes as the years went by, and soon the man was out of control. Eventually he was spending tens of thousands of dollars every year on bigger, flashier, and more opulent costumes. On various tours, he wore a cape made with $60,000 worth of chinchilla, a tuxedo embedded with diamonds spelling out his name, and a King Neptune costume covered in pearls and sea shells weighing 200 pounds. He had large rings shaped like candelabrum and a grand piano, each studded with diamonds, of course. "My costumes have become my trademark," he said, "and trademarks are hard to come by in show business." It wasn't just the costumes. He added showgirls, jugglers, singers, giant water fountains, light shows, a full orchestra, and even an elephant or two. During many of his shows he flew above the stage from a cable in a feather cape. He toured with a grand piano covered with thousands of glittering mirror tiles. He always sought to top his previous engagements with more outrageous glitz. "You can't take anything for granted as an entertainer," he said. "You have to be surprising, find new things to make the audience stand up and take notice." Liberace's millions of female fans were outraged in 1953 when he announced his engagement to a starlet. Women all over the country sobbed and wrote letters of protest. The engagement was quickly called off a few weeks later and is generally considered a publicity stunt. After all, Liberace was gay, which wasn't widely known at the time. In fact, Liberace emphatically denied his homosexuality throughout his career. He evidently thought that coming out of the closet would hurt his popularity, and his female fans belligerently refused to acknowledge the obvious. But that balloon burst for good when Liberace was sued for palimony in 1983 by a young man named Scott Thorson, who apparently had been shacking up with Mr. Showmanship for years. Liberace had Thorson on the payroll, dressed him up like himself, and paid for plastic surgery to have Thorson look more like himself. But even this bizarre scandal didn't dent Liberace's popularity. In the 1970s, Liberace moved to Las Vegas, which was appropriate since he was the highest paid performer in Vegas. The casinos loved him because he generated so much business. In Vegas, the husbands gambled while their wives went to Liberace concerts. Vegas is a city built on fantasy, superficiality, and profligate spending, and those were Liberace's calling cards. Both Las Vegas and Liberace proved the same motto: Nothing succeeds like excess. 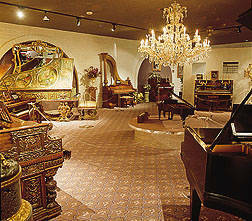 In 1978, Liberace built a museum to himself and to his opulent tastes in Las Vegas. The museum contains Liberace's collection of smaltzy cars, a gold casting of Liberace's hands, dozens of candelabra, a painting of his mother, a rotating rhinestone-covered piano, the multi-million dollar stage wardrobe, his collection of rare and antique pianos, the glittering stage jewelry, not to mention the world's largest rhinestone. Almost nine years after Liberace's death, the Liberace Museum remains one of the most popular tourist attractions in Las Vegas. Liberace reached the pinnacle of his career in the mid-1980s at Radio City Music Hall in New York City. Spanning three extended engagements in 1984, '85 and '86, he sold out 56 straight shows. Liberace called his Radio City shows "the fulfillment of a dream and the culmination of my forty years in show business." Even the music critics were impressed. The New York Times wrote, "Liberace has arrived at a style that is an ornamental genre unto itself. He is a one-of-a-kind musical monument." He made a grand entrance for each show in a Rolls Royce limo. After it was driven onto the stage, out popped Mr. Showmanship, all smiles and blown kisses, decked out in a naughty red, white, and blue hot pants outfit. Actor Jeremy Irons summed up Liberace's appeal when he said, "If you want to kitsch, there it is. I couldn't live on it, but it is fun to see." Just a few weeks after his 1986 engagement in New York, Liberace became ill. By January of 1987, he was confined to bed. His handlers denied that he had AIDS, but the rumor spread, and the media vultures circled. A horde of reporters and onlookers gathered outside his Palm Springs house, where he was bedridden, for the death watch. Liberace departed this world on February 4, 1987, at the age of 67. His burial was postponed until an autopsy was performed, which confirmed that he had died of AIDS. Evidently, the more fame you attain, the less privacy and dignity you are permitted, even in death. To this day Liberace's astounding success seems puzzling. Why would middle-aged, midwestern family gals, generally an extremely sensible group, swoon like schoolgirls at the sight of an outrageous piano-playing borderline drag queen? The mystery deepens when you consider that he maintained superstar status for almost four decades. Maybe he brought out the maternal instincts of these women with his sweetness, gentle humor, and sentimental nature. Liberace's appeal couldn't have been related to his talent. He wasn't admired for his singing, songwriting, or acting; his piano playing was ridiculous; and he didn't sell nearly as many albums as other famous musicians. "I'm no good," he once admitted. "I've just got guts." Maybe the secret of his success had something to do with the fantasy world he created on stage. In that world everything was romantic and fun and silly, no expense was spared for the finest things, and, most importantly, the dirty, ugly aspects of everyday life did not intrude. Only the style, the frilly expensive clothing, the piano fills, the candelabra, and the corny sentiment had any meaning. His female fans, perhaps longing for an escape from the everyday humdrum, bought into this dreamland wholeheartedly. There's also not much that Americans love more than money and the freedom it brings to overindulge. That was Liberace's cup of tea. He wallowed in his riches, and the audiences loved him for it. Maybe he represented the ultimate possibilities of the American dream to his fans. 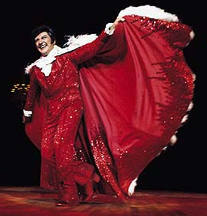 Or maybe it's just that every segment of society needs its drag queens, and Liberace was middle America's. 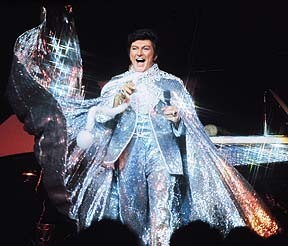 Whatever the reason, I'm just happy I got a chance to witness the wild spectacle Liberace created. I count it as a fond memory. who attended a Liberace concert with the author in Indianapolis in 1983. Photos provided courtesy of the Liberace Foundation. They are copyrighted and property of the Liberace Foundation and Museum.